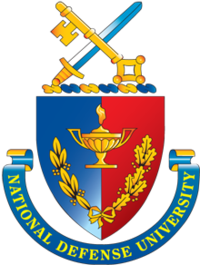 National Defence University is a publicly funded military institution located in Islamabad, Pakistan dedicated to the study & research in military science, geo-strategy and international relations. The vision is focused to craft NDU as an exceptional academic & research center mentoring in diversified disciplines, which will provide international level curriculum & strategies on national security, promoting the free, open and critical inquiry that can serve society independently. The university’s mission is to impart higher education in policy and strategy formulation at various tier with emphasis on national security and defence, and act as a national think tank. The Jasmine wreath in gold is placed upon the green background of the national color. This university is recognized from HEC & PEC. National Defence University is a famous university of Pakistan which offers many programs and you get all programs admission detail online free from here. It is founded in 1970 as the staff college. National Defence University aims to develop military and disciplined features among its local and foreign learners to prepare future leadership from both public and private sectors via quality educational and research programs based on security and contemporary studies. Now we share with you complete fee structure of NDU. “1st semester charges alongwith one time charges to be paid at the time of admission. Thesis fee to be paid upon submission of first draft of thesis. Semester charges for 2nd semester onward to be paid within 30 days of start of semester.